Our range of services include japanese interpretation service, japanese language translation service, professional japanese translation language service, professional japanese translation service, japanese language interpretation service and japanese translation services. We offering Japanese Interpretation Service. we have professional and experienced interpreter, we always assign our best candidate as per the client’s requirements within the requested period of time. In addition to this, we are offering these services at very reasonable rates. In order to cater the client’s needs, we are offering a wide array of Japanese Language Translation Service. These services are rendered under the direction of experts. Offered services are highly credited for their promptness, high client satisfaction, cost-effectiveness, and reliability. We are providing a high-quality array of Professional Japanese Translation Service. Offered array of services is rendered by talented teams with following the industry quality norms. Apart from this, offered translation services are available at very reasonable rates. To furnish the needs of patrons, we are engaged in offering Professional Japanese Translation Services. We provide translation services from single page to huge volume. Apart from this, we are offering this translation service range at the budget-friendly market price. We offering Japanese Language Interpretation Service. we have professional and experienced interpreter, we always assign our best candidate as per the client’s requirements within the requested period of time. In addition to this, we are offering these services at very reasonable rates. 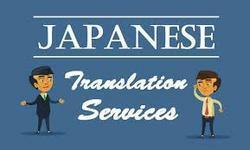 We provide Japanese Translation Services to our valuable clients. Japanese Language Experts Are Well Educated Professionals Having Their Degrees From Reputed Institutes. The Language Translators in Our Team Can Easily Translate The Given Text From English To Japanese And Vice Versa.